Jumbo Bright Ultra Bright outdoor and special event teleprompter displays from Jumbo Bright Prompters. 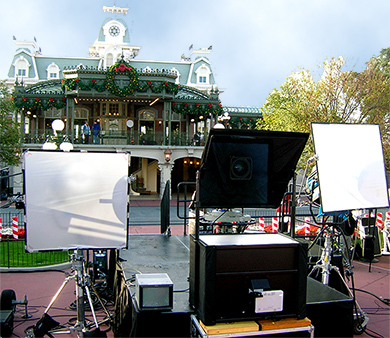 The playing field for outdoor and large room teleprompter displays has now shifted and once again, Tennessee Prompters is leading the way. Simply put, Jumbo Bright displays are the biggest, the brightest, the most durable and most reliable outdoor, convention and special event teleprompter displays you’ve ever seen. And, with $200,000 dollars worth of Jumbo Bright displays and four display size options to select from (32”, 45”, 70” and 105,”) Tennessee Prompters is certain to have the right Jumbo Bright display for your next production or event. Brighter Than Video Monitors: Jumbo Bright’s ultra bright projection-based displays are ten times brighter than LCD-LED monitors, even High Bright models. Long Distance Displays: Yes, there are now truly readable arena and large room displays… ones which can be read from great distances… up to 180 feet! Readable Outdoors: Jumbo Bright ultra bright displays work perfectly well outdoors, even in bright, direct sunlight. Won’t Overheat: Jumbo Bright’s laser projector based displays won’t overheat or black out like traditional LCD displays, even outdoors on the hottest of days. Invisible Text: Unlike typical, large room and arena displays, Jumbo Bright Prompters’ patented technology displays are specifically designed to keep your audience, and video-film cameras, from seeing the prompted text… it’s invisible! Realistic Eye Contact: Eliminate teleprompter Ping-Pong by adding a third or fourth read point. Stop looking at your feet and/or at the ceiling by locating Jumbo Bright displays behind, within or in front of your audience. Eliminate Obstructions: Get that podium display glass out of your face and out of your image magnification video. Reclaim Stage Space: While you’re at it, get that podium display off your stage altogether and make the most out of your precious stage space. Less Conspicuous: It’s true, Jumbo Bright displays are indeed bigger, brighter and more readable but they are, believe it or not, typically less noticeable than traditional displays because Jumbo Bright displays can be placed in much lessconspicuous locations. And they are less conspicuous because Jumbo Bright’s displays keep audience members, and cameras, from seeing prompted text. Invisible Fencing: The text for all Jumbo Bright displays slowly fades to gray as you walk out of your projected sweet spot. That helps you stay inside fixed stage lighting areas and away from sound monitor feedback. Reliable & Affordable: Jumbo Bright Prompters have a 90 percent re-rental rate because they are readable, reliable and affordable. Find out for yourself.